Shirts With Random Triangles: Solomon Thomas announces commitment to Stanford with tree and nerd glasses. Solomon Thomas announces commitment to Stanford with tree and nerd glasses. Solomon Thomas has an early lead in the "most creative National Signing Day announcement" competition for 2014. The five-star senior defensive lineman who attends Coppell (Tx) High School announced his decision to sign with Stanford with a little humor. 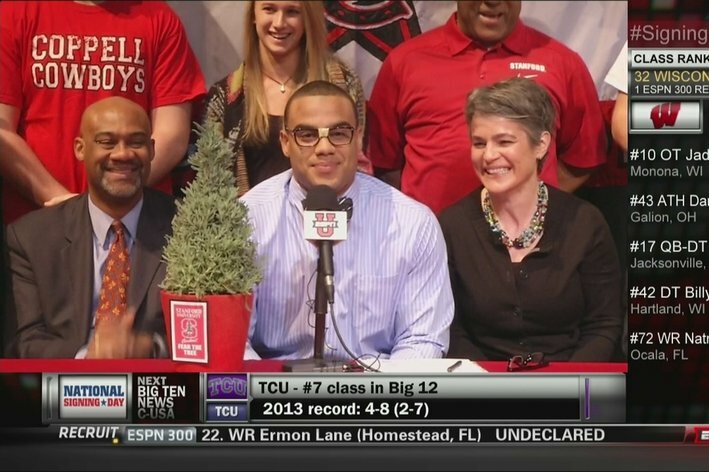 Signing your letter of intent with a tree and a pair of nerd glasses. That's so Stanford.